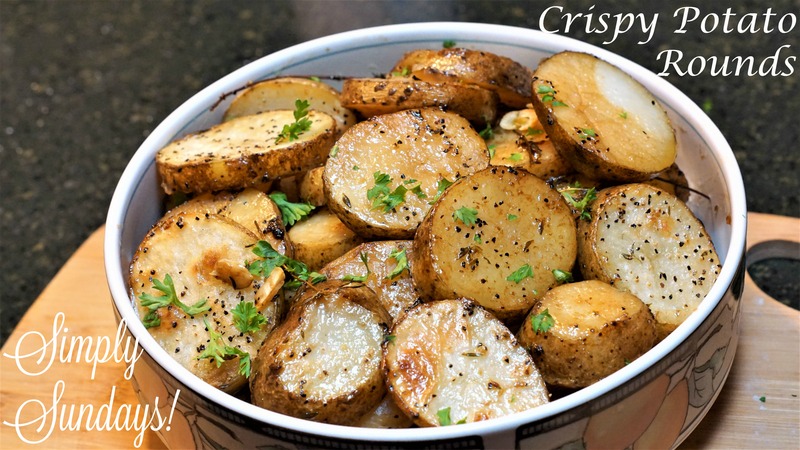 Crispy Potato Rounds – Simply Sundays! Could it be the Irish part of us influencing what sides we choose to serve? Or could it be that potatoes are inexpensive, versatile, delicious and loved by most? The potatoes are crisp, they’ve absorbed delicious flavor from the broth and thyme and are topped with nutty garlic… oh Mama! Serve up with your favorite meal and watch them disappear! This is by FAR the best potato recipe I’ve ever tried! I used baby red potatoes and cut them into quarters and followed the rest of the directions. These came out crispy on the outside and soft on the inside. The seasoning was perfect and I loved the addition of the chicken stock. I did use minced garlic instead of the large 3 rough chopped garlic cloves, which I wouldn’t recommend. The garlic did burn. These guys really know their stuff! These are a must try! Thank you Shauna! So glad you liked them! !